In small bowl, crush 1 cup of the strawberries with pastry blender or fork. Reserve remaining 1 cup strawberries. In medium bowl, pour boiling water over gelatin; stir about 2 minutes or until gelatin is completely dissolved. Stir crushed strawberries into gelatin. Refrigerate 20 minutes. Meanwhile, leaving granola bars in pouches, crush granola bars with rolling pin. 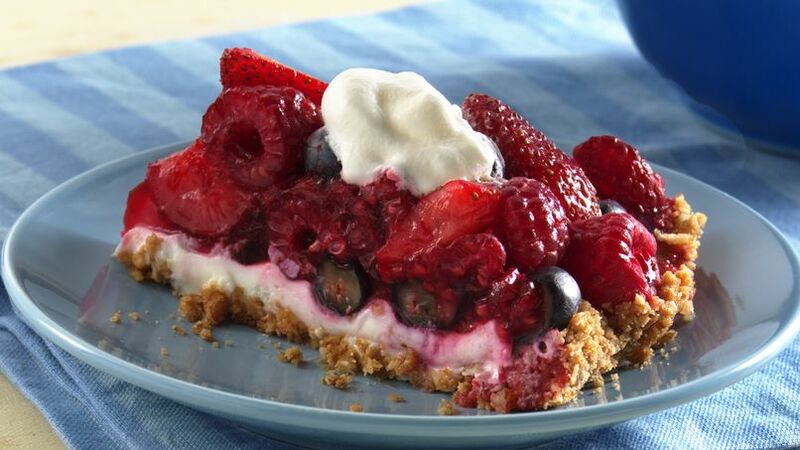 Sprinkle crushed granola in bottom of 9-inch ungreased glass pie plate, pushing crumbs up side of plate to make crust. In small bowl, beat cream cheese, sugar and almond extract with electric mixer on medium-high speed until smooth. Drop by spoonfuls over crushed granola; gently spread to cover bottom of crust. Gently fold blueberries, raspberries and remaining 1 cup strawberries into gelatin mixture. Spoon over cream cheese mixture. Refrigerate about 3 hours or until firm. Serve topped with whipped topping. The same pigments that give strawberries and blueberries their intense colors are thought to help prevent disease. The great thing about having fruit in dessert is that it is likely to be eaten!